A building is remembered for its strength, efficiency, aesthetic appeal and unique architecture. And, a good architecture is dependent on an unending quest to try something new. In this regard facades completely fits the bill. Facade can be described as an envelope of a building. A clay facade even does more. They bring efficiency and elegance at one go. Aspect is one such product which you must know about. Ingenuity and sophistication are the hallmarks of Aspect – offering a selection of superior terracotta panels to fulfil the imaginative design aspirations of Architects. Recently, PM Modi inaugurated ESIC medical college & hospital building in Coimbatore. The PM stated that he strongly believed in the improvement of public service delivery standards and in keeping the same in mind, several initiatives had been started to improve the quality of service delivery in ESI hospitals. He also said that the Union Government had taken a number of path-breaking steps for the welfare of workforce of our country. The building is appreciated all over the nation for its the elegant looks, made out of Aspect clay facades. You will be delighted to know that they are highly functional and give efficiency as well by keeping indoor environment healthy and thus reducing the overall energy consumption. Wienerberger proudly presents its new offering Aspect clay facades. They conform to international quality standards, and are comfortable to install, meets the varied demands of indigenous architectural design trends. The role of facade: The hospital structure has been sketched in such a manner that indoor air quality in maintained at all point of the day, and what better choice than a facade. Facade claddings are excellent heat insulators. Because of high heat resistance and presence of ceramic, they help in minimising heat loss in winter and overheating in summer. Thereby, creating a smooth environment for the people and patients inside. Other than that it gives an exquisite look. Aspect role: Aspect facade played a big role in enhancing the overall look and life cycle of the hospital building. 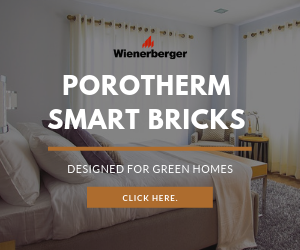 Aspect is brought to you by Wienerberger, The world’s largest clay building material solutions provider, headquartered in Vienna, Austria, with a heritage of over 200 years. Even after long years, the Aspect retains its value, long after construction. Because of its natural and environment-friendly constituents, these facades has contributed towards longer shelf life of the hospital building. Aspect façades are of natural, environment-friendly material enhanced with superior finish, weather-resistant, fast colour. The ceramic colours remain intact even when exposed to rough weather. High strength and tested safety make Aspect façades a safer and cost effective choice. Due to its inherent insulation properties and energy storage ability, ‘Aspect’, leads to increased thermal insulation and reduces the energy consumption of a building. Therefore, overall efficiency is stabilised for the hospital building, for the generations to come. Aspect has been accepted and appreciated worldwide for its functionality and convenience. They are successfully providing elegance and efficiency at the same time to the buildings. Ingenuity and sophistication are the hall marks of Aspect – offering a selection of superior terracotta panels to fulfil the imaginative design aspirations of Architects. Here are some of the beautiful projects which are done using Aspect. B2B Corner, Project Focus architectural designs, Aspect, Building exteriors, Facades, Facades for buildings, PM Modi. permalink.